I hope you are having a wonderful week! 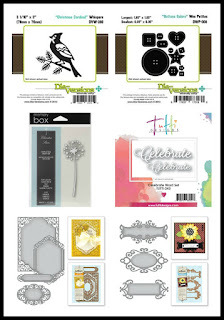 It's time again for a new challenge at Scrapy Land and the challenge is: Anything Goes PLUS is a brand of die Scrapy Land carries... there are over 55 brands to choose from!!! 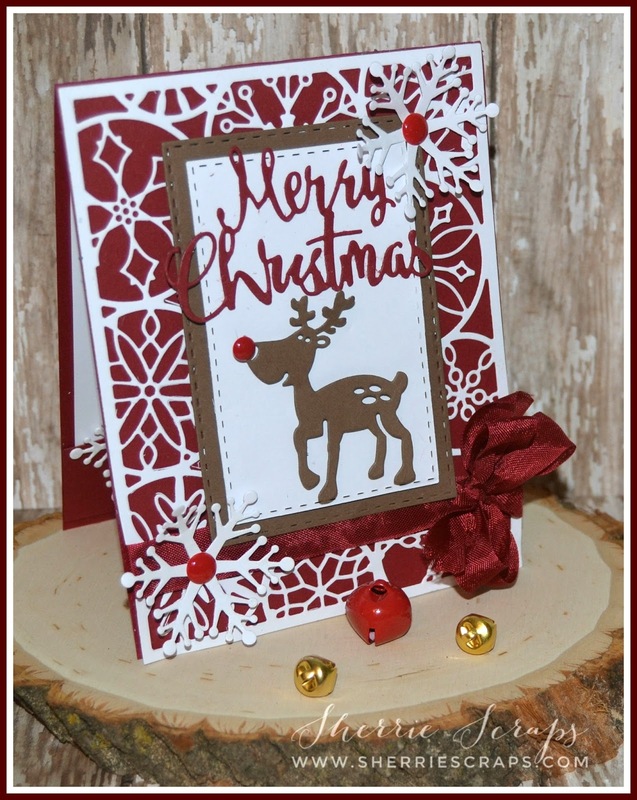 For my Christmas cards I started with a red card base and followed with the Spellbinders A2 Devine Eloquence Die. 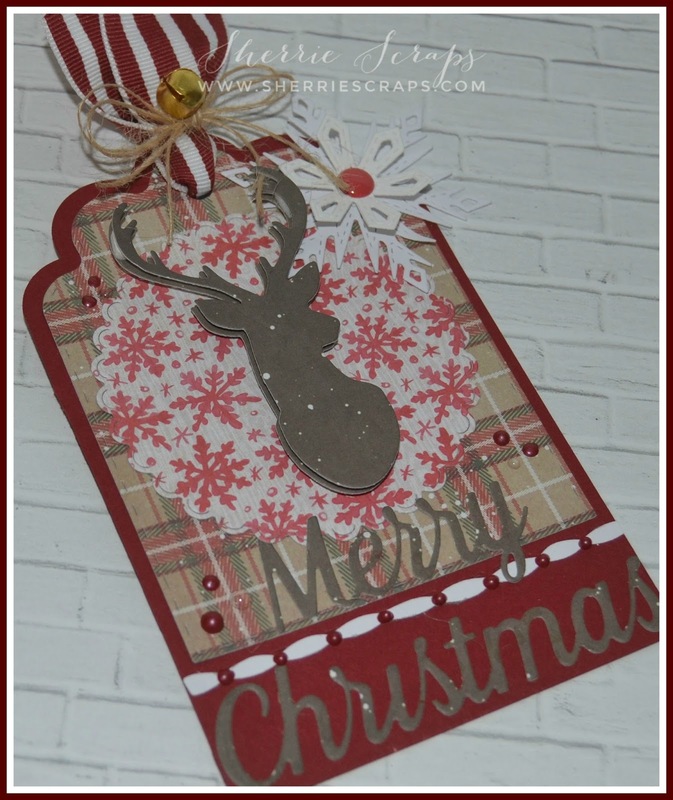 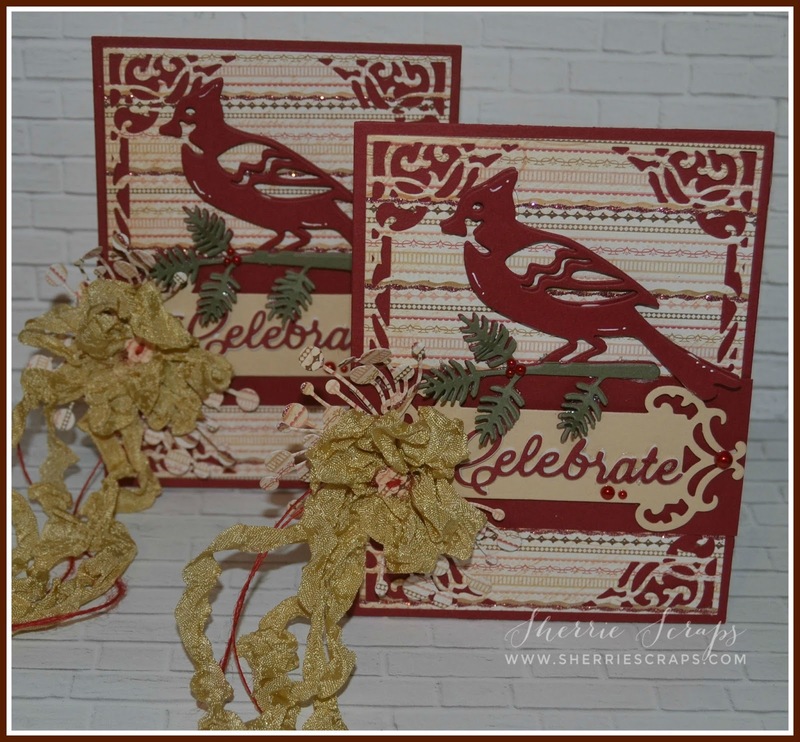 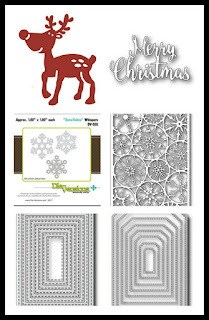 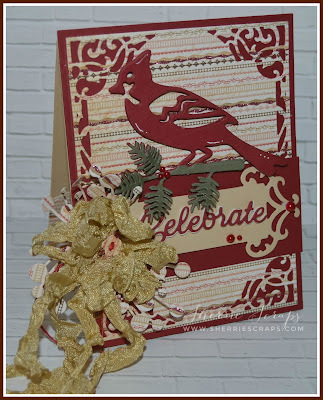 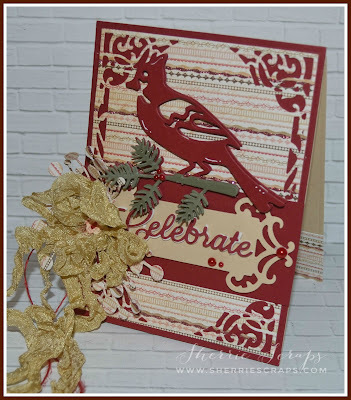 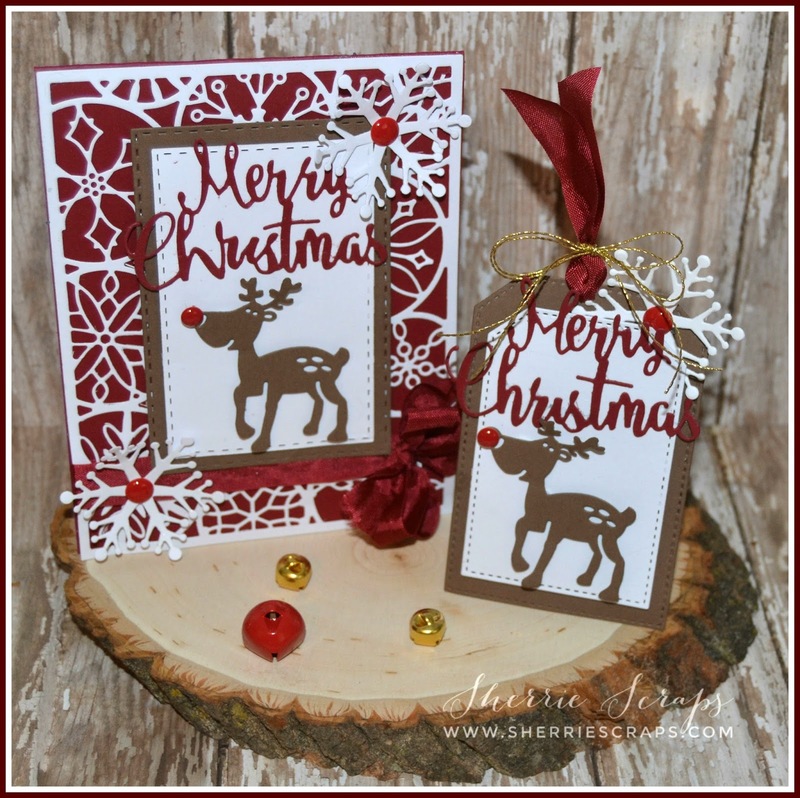 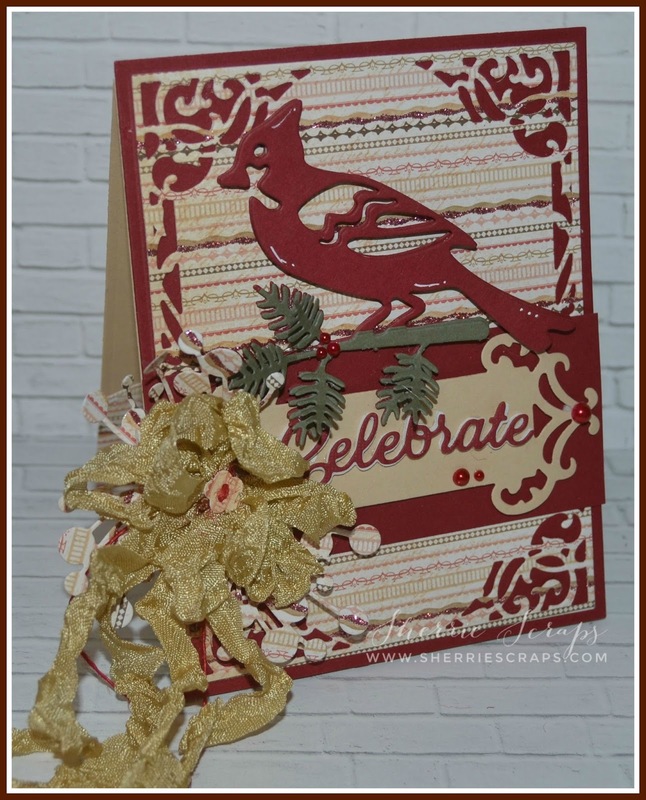 The pretty cardinal is the Die Versions Whispers Christmas Cardinal Die, cut out a few times for added dimension. 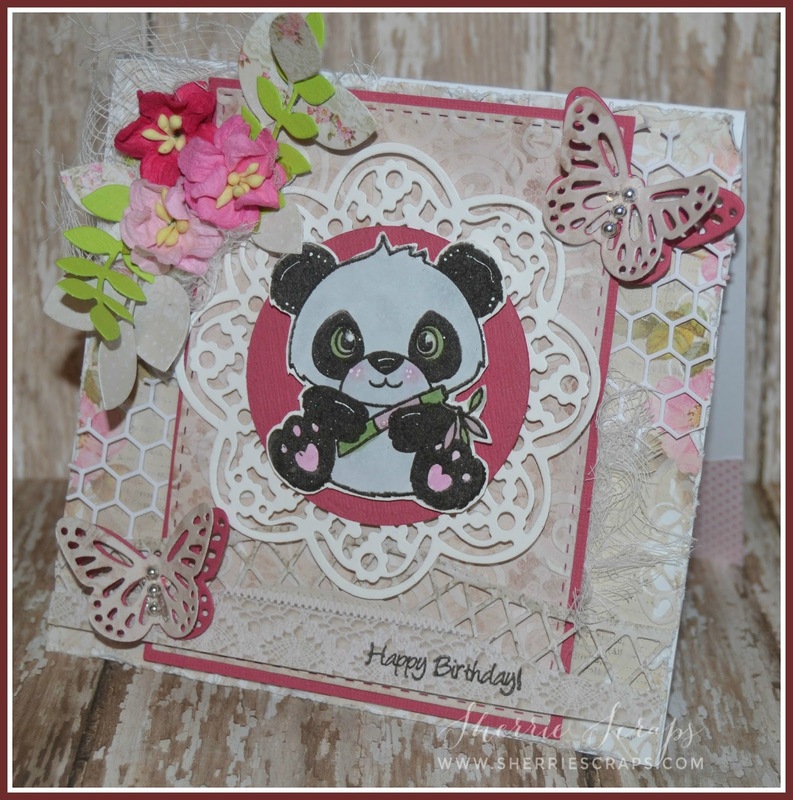 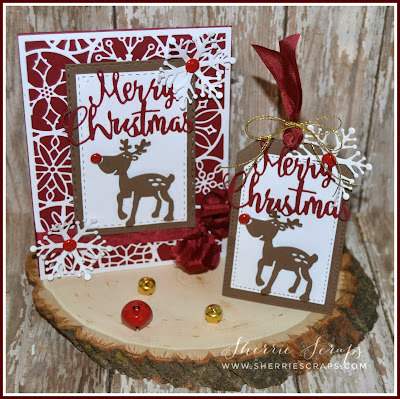 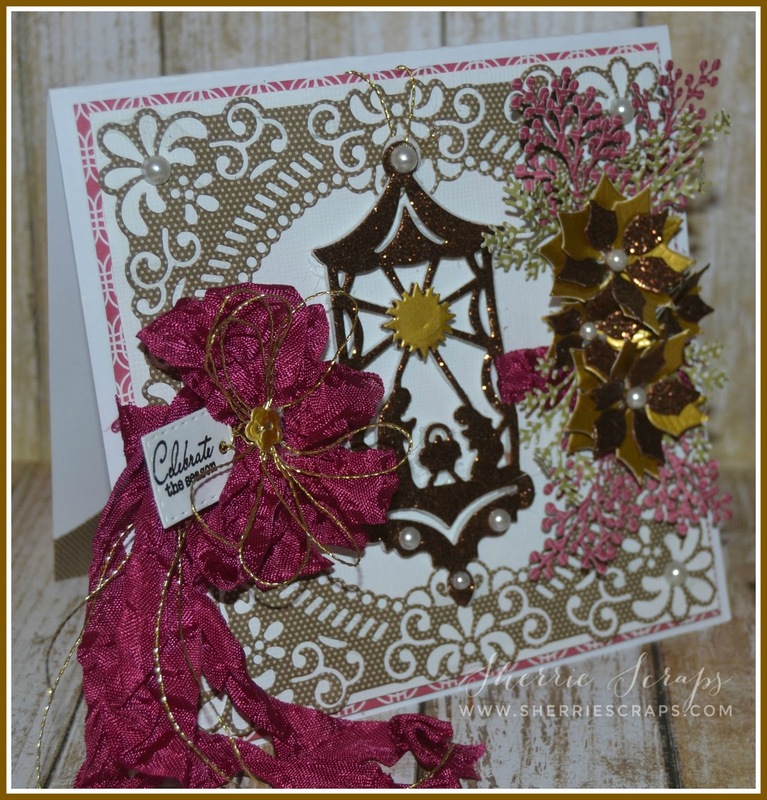 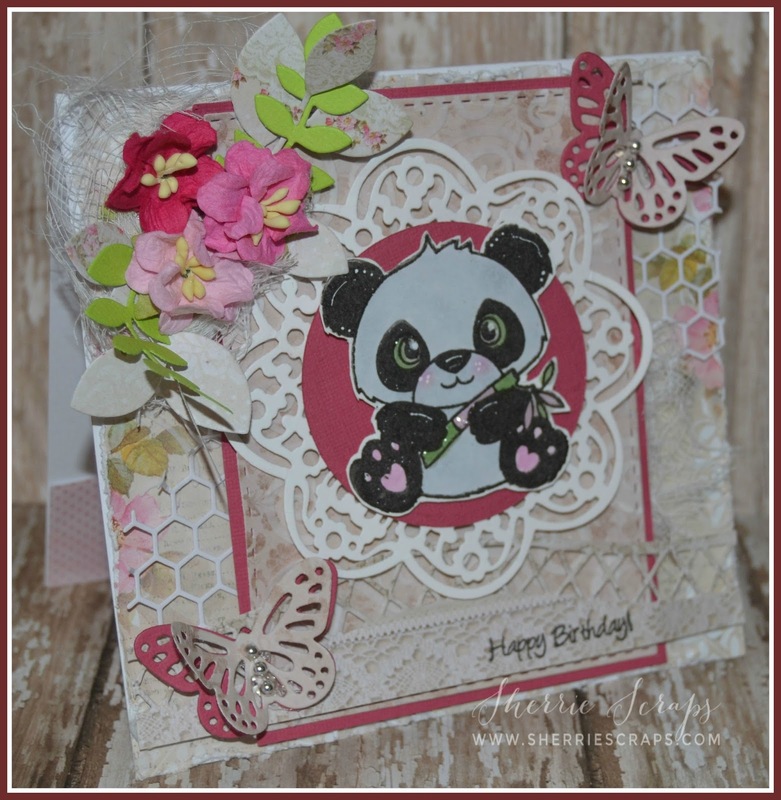 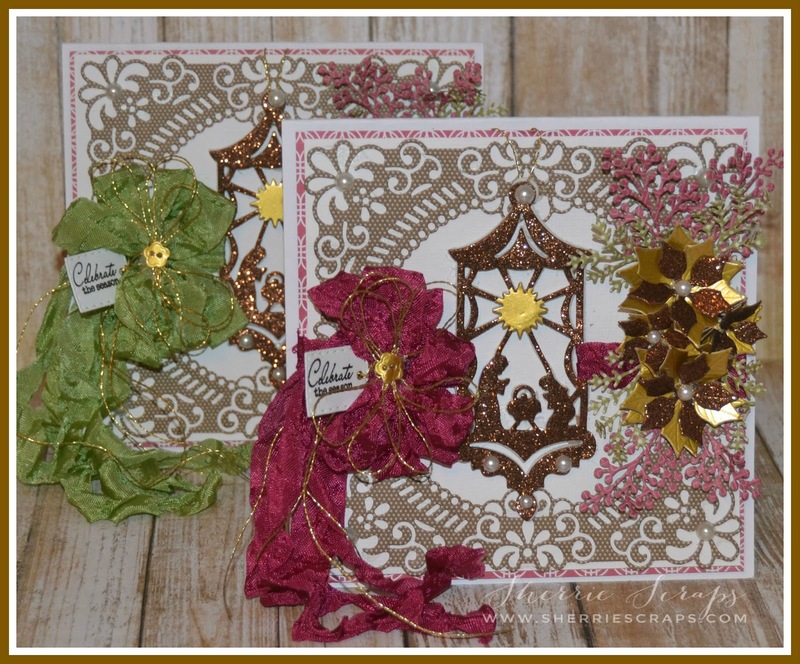 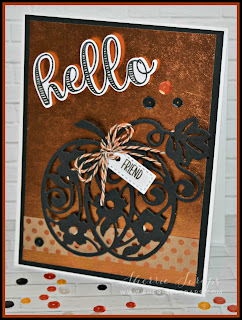 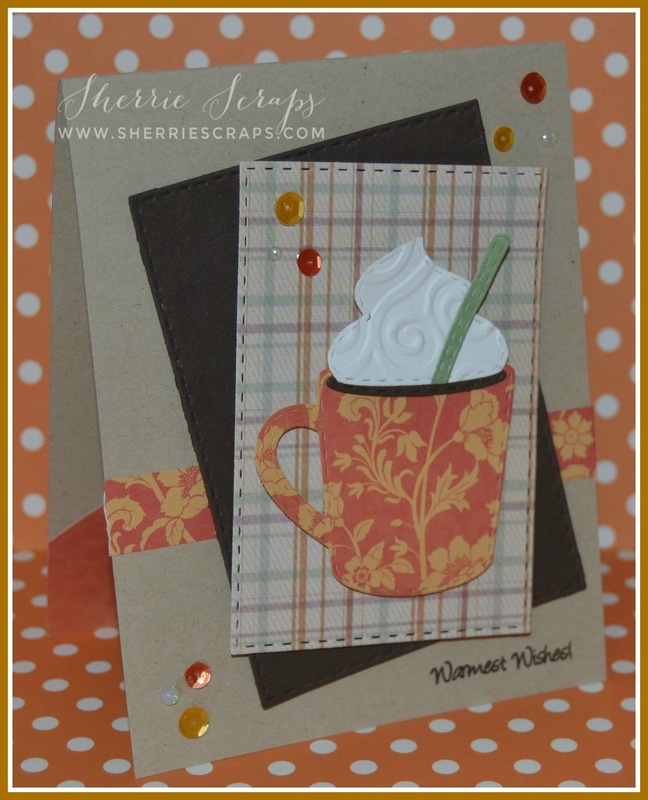 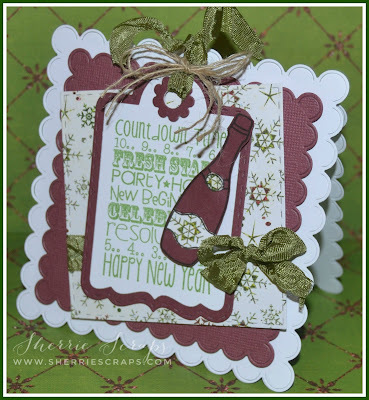 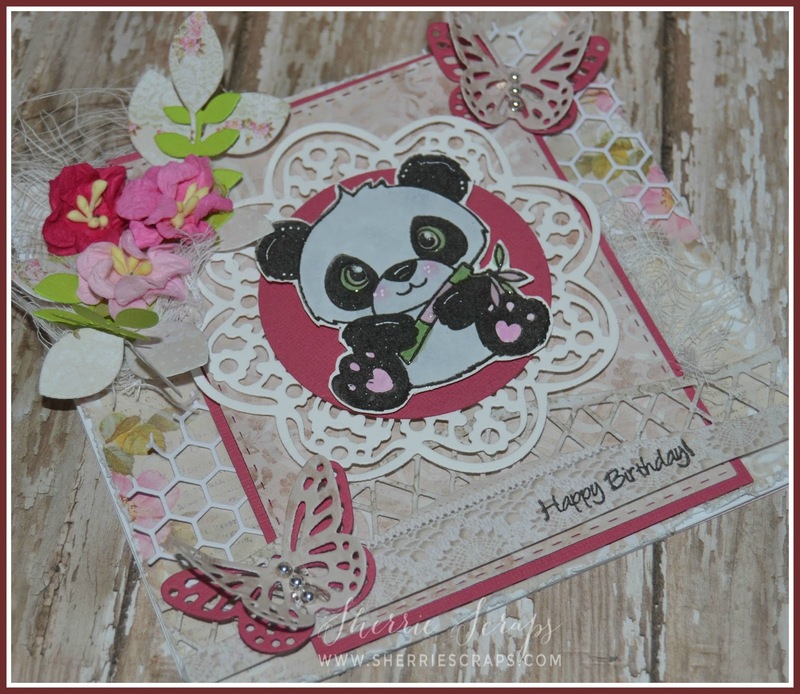 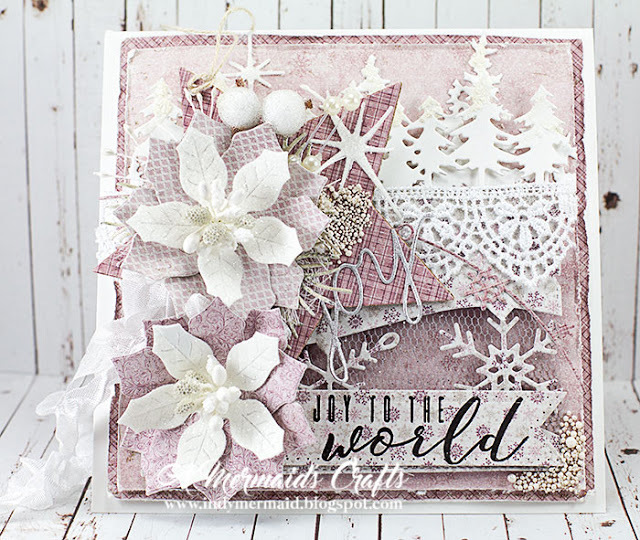 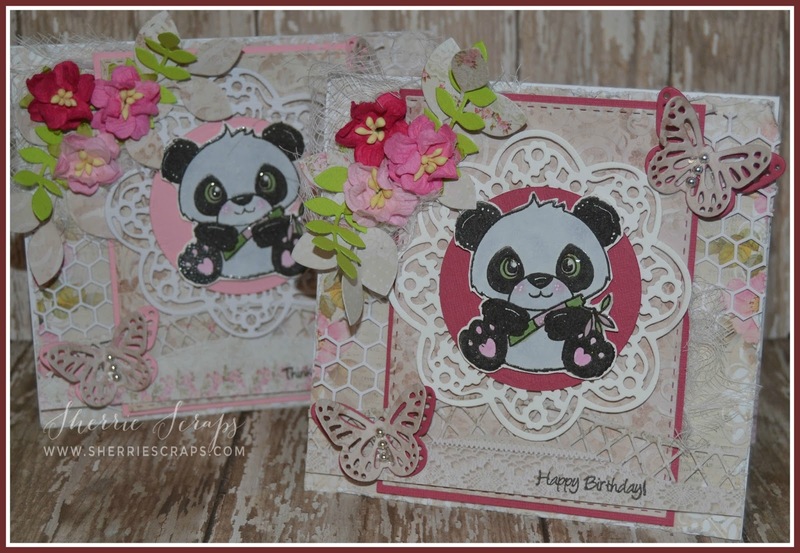 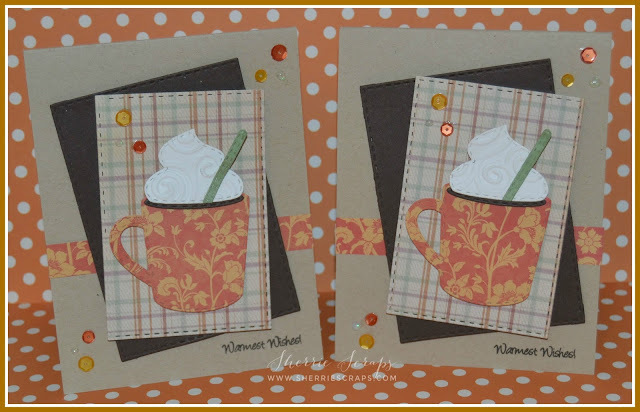 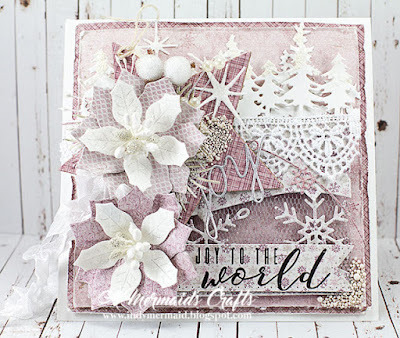 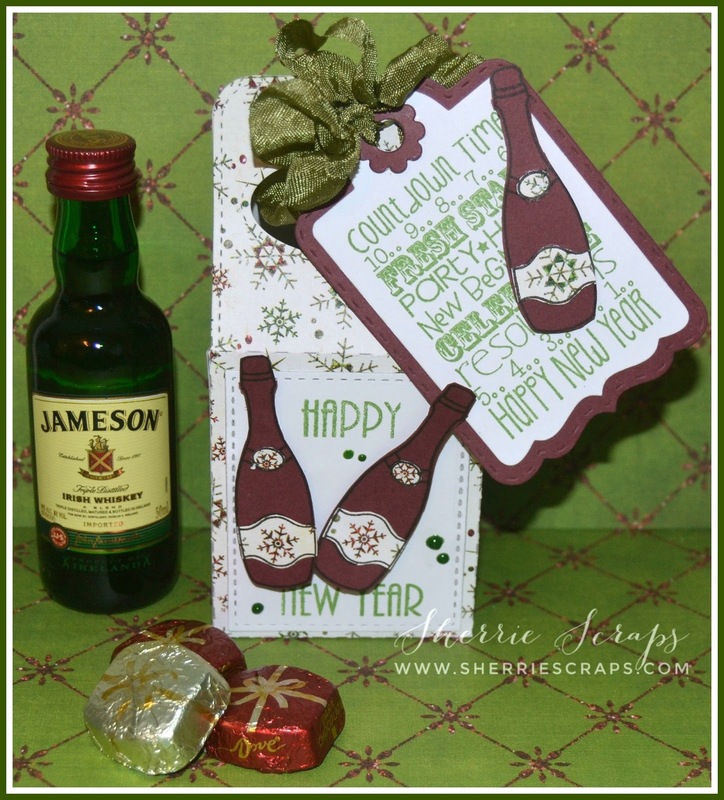 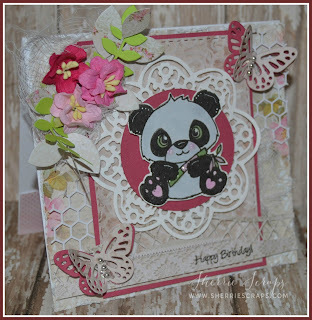 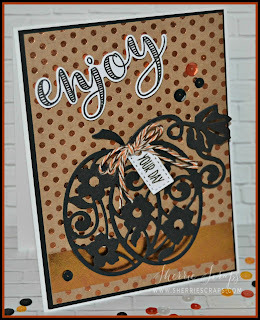 The Tutti Designs Celebrate Word Die is layered onto a Spellbinders Fancy Tag Two Die. 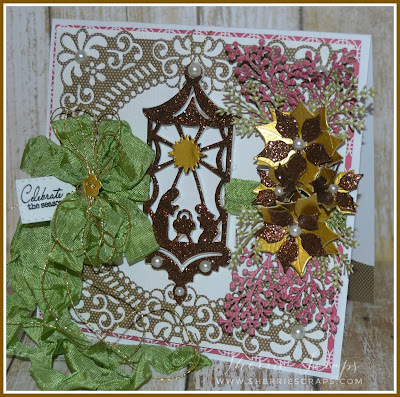 Beneath the pretty bow is the Memory Box Chandra Stem Die. 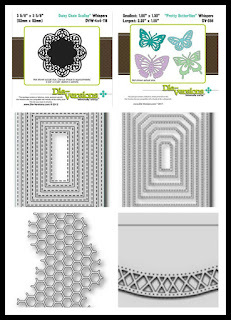 The pretty ribbon is from DL.ART and the center is the Die Versions Buttons Galore Die. 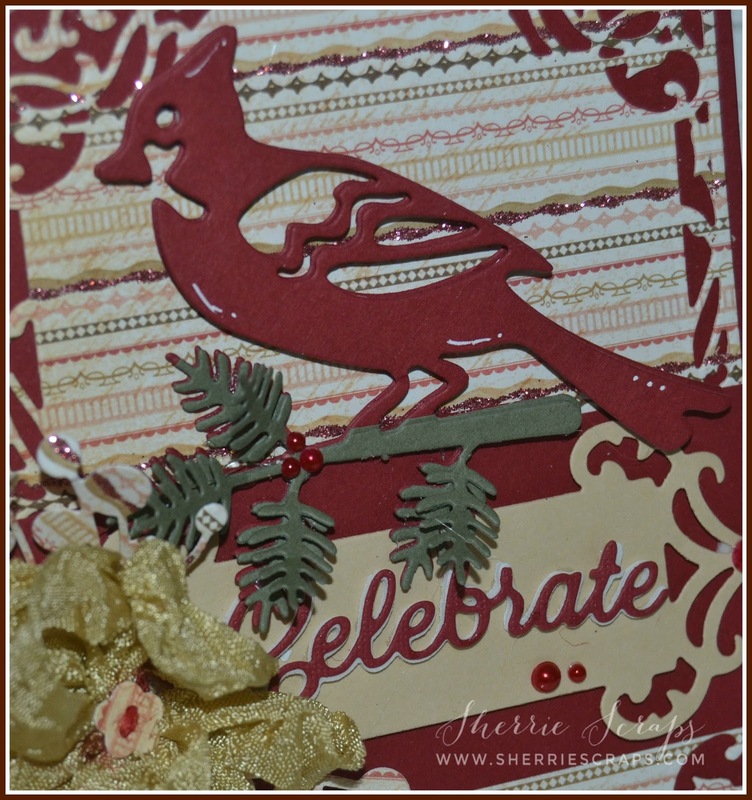 The red berries on the sprigs were created with Viva Glitter Liner Ruby. I have been "trying" to get back into some crafting again..it's been way to long!!!! 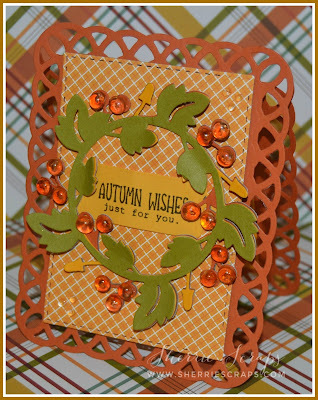 Beside my DT commitments, I have not had the time to get in my craft room for much more as you can tell. 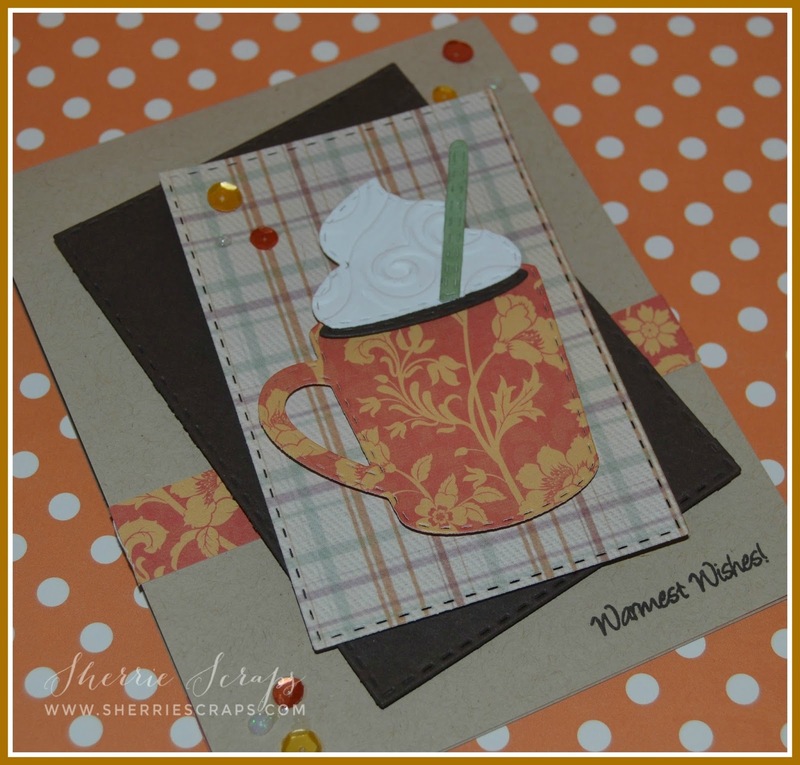 It has been busy this past summer with 2 new grand babies in our family....I am loving the snuggles! 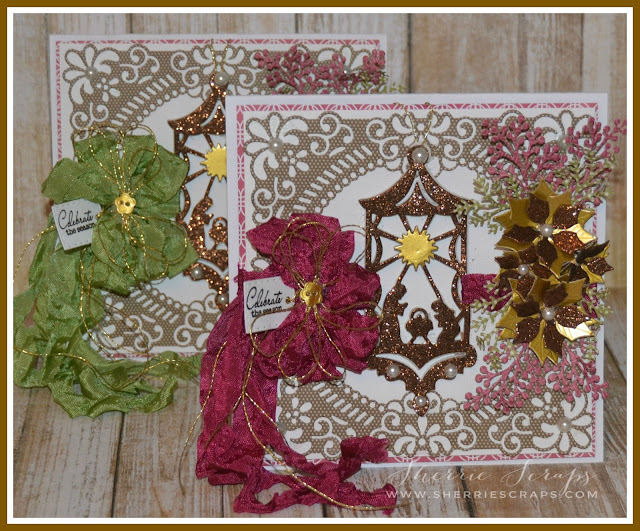 This makes 4 granddaughters and 1 grandson...feeling very blessed!!! 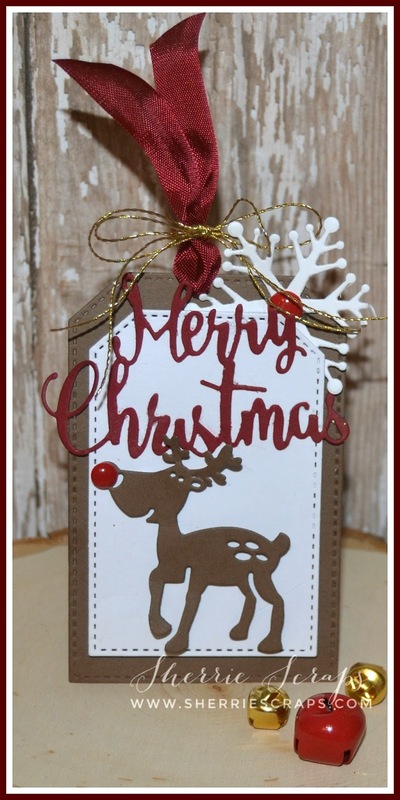 For those of you who follow me, also know my father had a major stroke back in April which took his eye sight along with some memory loss. 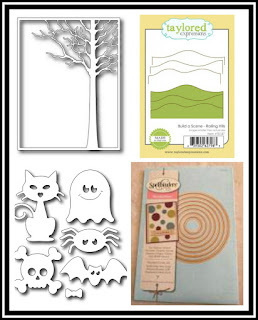 I have spent a lot of time traveling back and forth home (240 mi RT) a few times a week to help comfort/support him through this tough time. 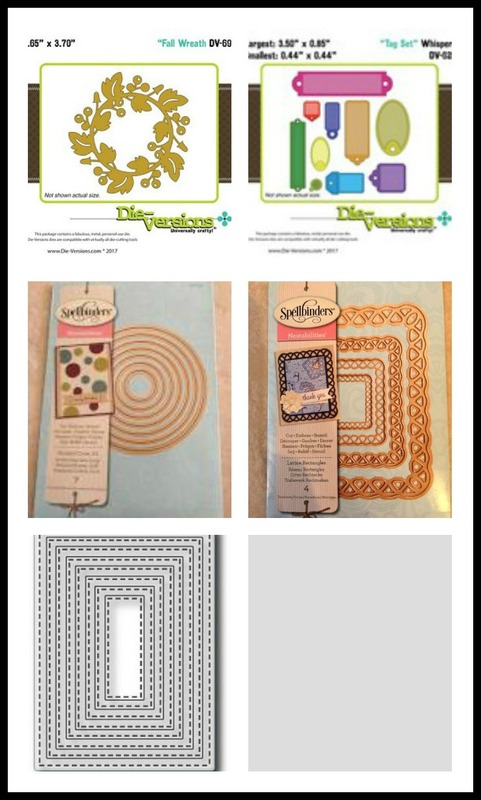 After leaving the stroke recovery center a few months ago, he is now in the long term nursing home center in his home town where most of my family lives which has made it a bit easier. It has been overwhelming to say the least but I think things are starting to ease up some~thanks for all the prayers, comments, emails and cards. I am touched by your kindness and forever grateful for your friendship!!! I was excited to get some time in my kitchen and my craft room the past few days, lol. 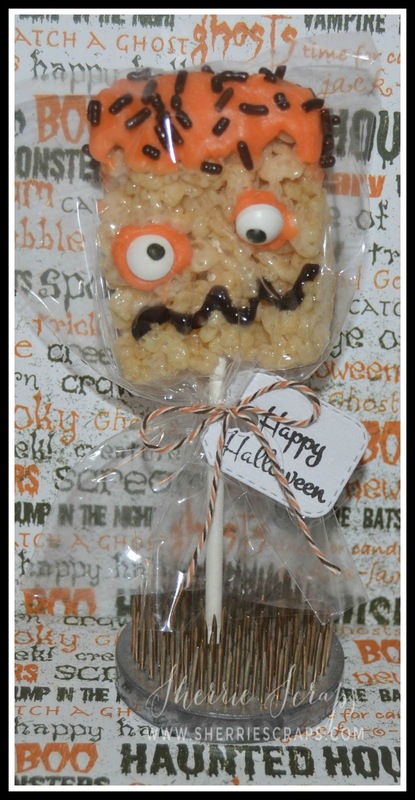 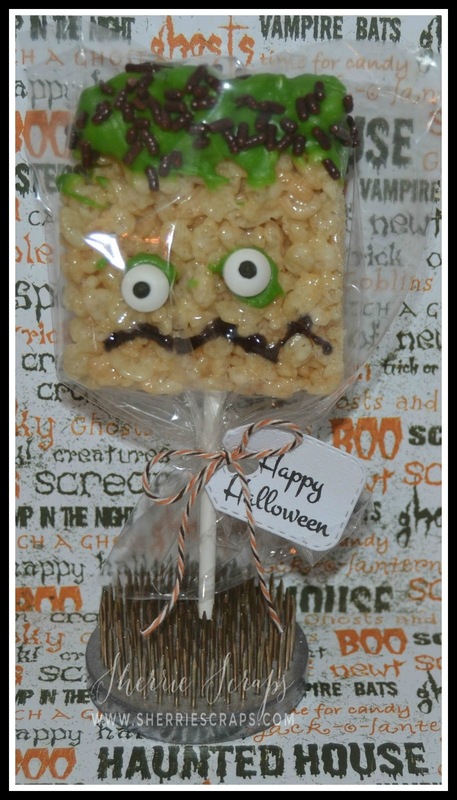 I have a fun, yummy treats to share today...perfect for Halloween, don't you think? 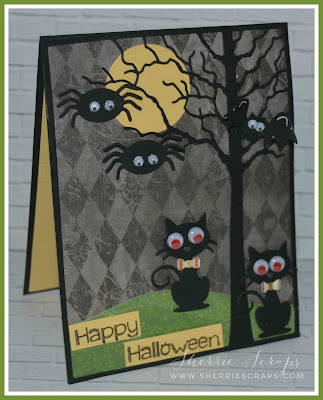 Wow, can you believe it's almost Halloween...are you ready? 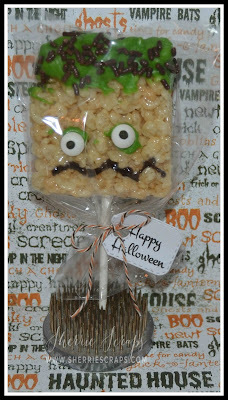 I started with making rice krispie bars. 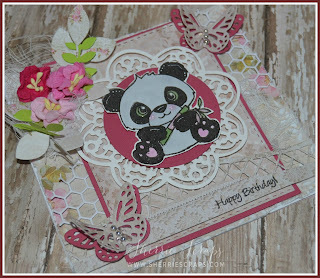 I then let them set up, cut into squares and poked in the sticks. 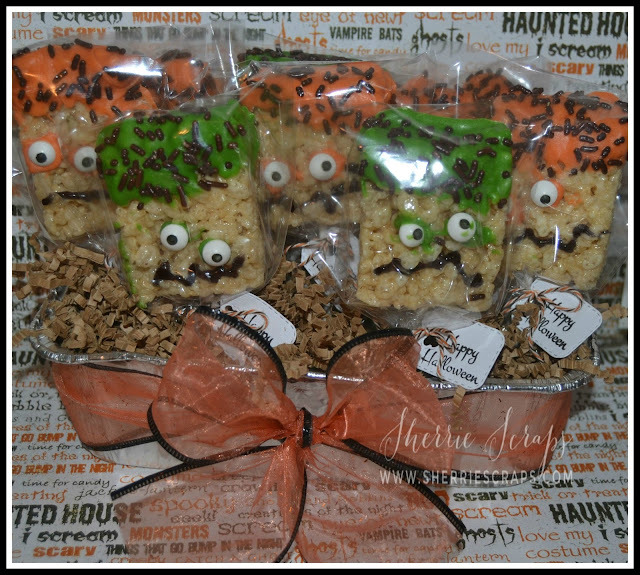 For decorating these monsters...I used Wilton candy melts, candy sprinkles, edible candy eyes and black frosting, all from Michael's craft store. 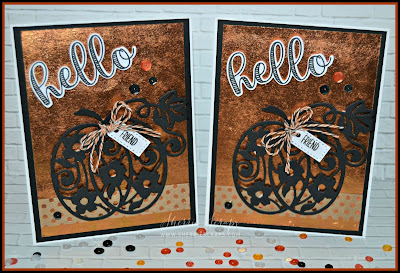 I put them in cello bags and added a cute tag created with Jaded Blossoms Mini Tag Dies and the Halloween Treats stamp set. 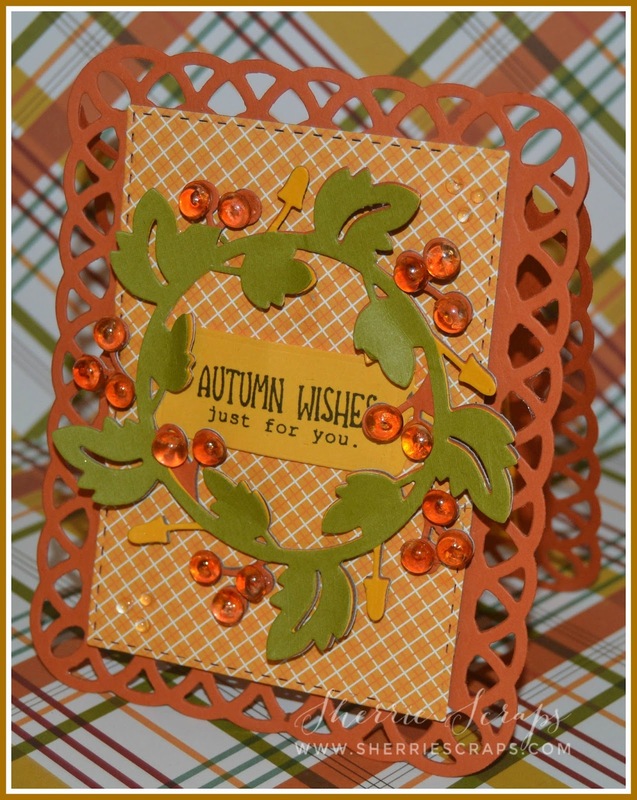 The cute twine bow is tied with Trendy Twines Spiced Pumpkin. It's time again for a new challenge at Scrapy Land and the challenge is: Anything Goes PLUS is a brand of die Scrapy Land carries... there are over 55 brands to choose from!!! Today, I decided to share a few Christmas cards. 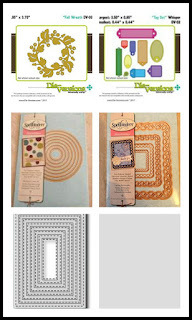 The papers are from SU and My Mind Eyes. 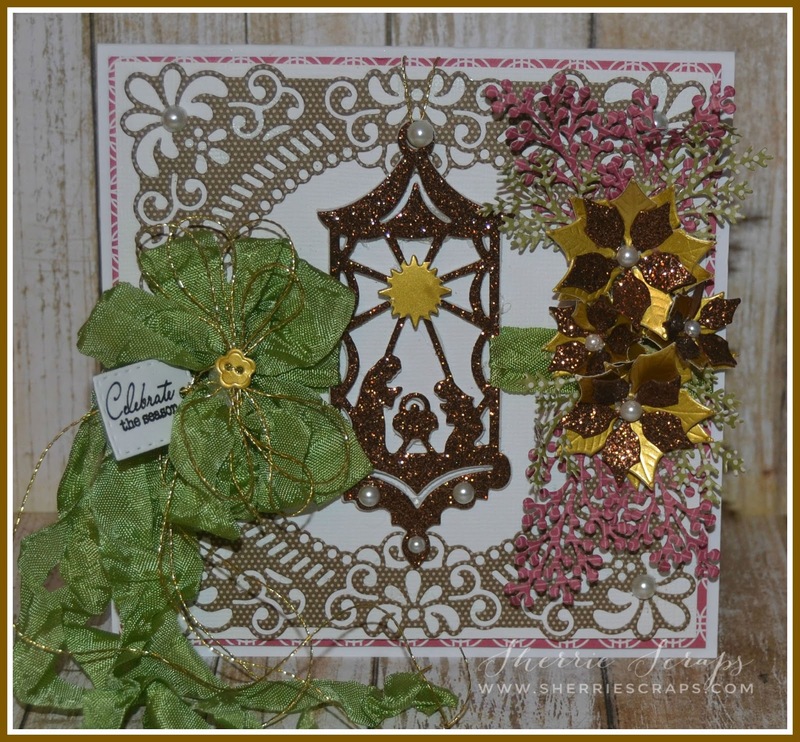 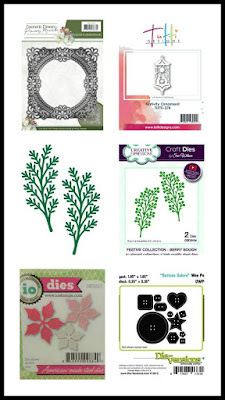 I started with my base and base layer and then followed with the Precious Marieke Square Flower Frame Die. I just love this beautiful Tutti Nativity Ornament Die that I recently picked up from Scrapy Land. Isn't it beautiful? 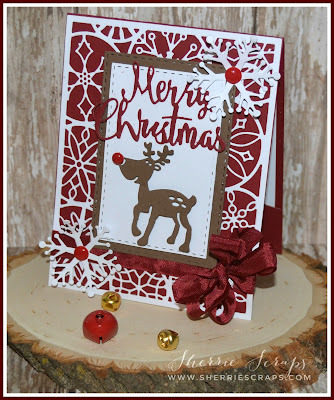 I die cut it out of sparkly paper that I had in my scrap stash. 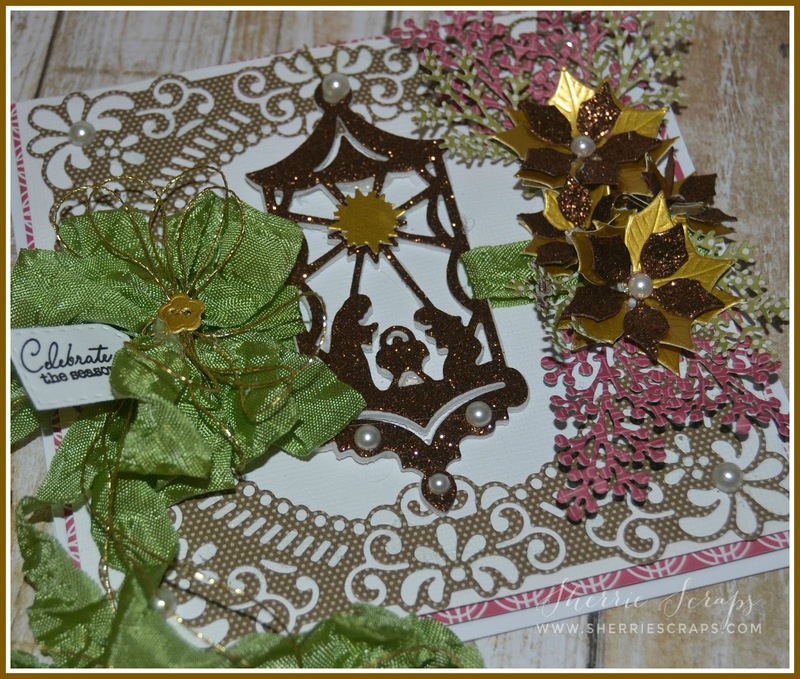 I finished with adding some pretty ribbon from my sweet friend, Diana at DL.ART and the tag and sentiment are from My Craft Spot, no longer in business. Today, I am sharing a couple of Halloween cards. 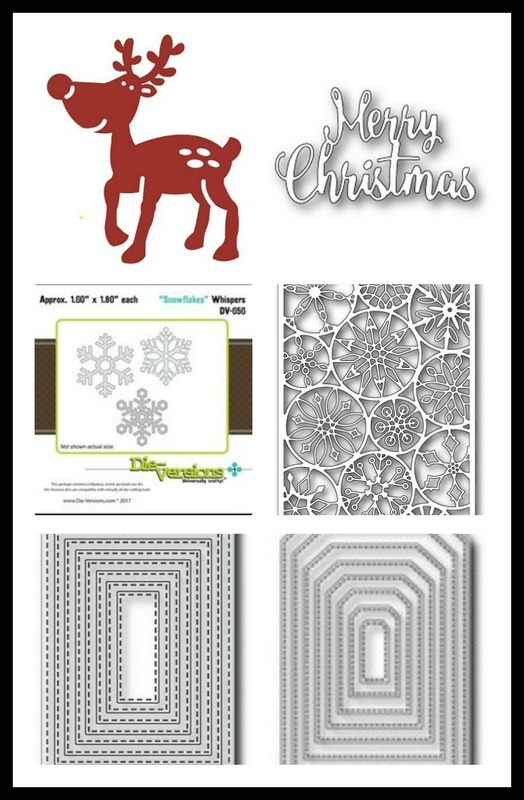 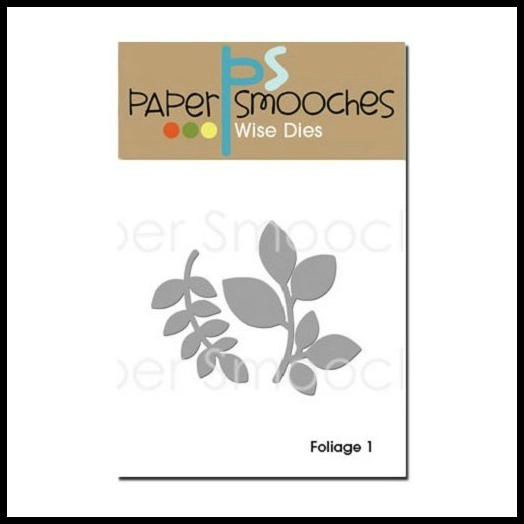 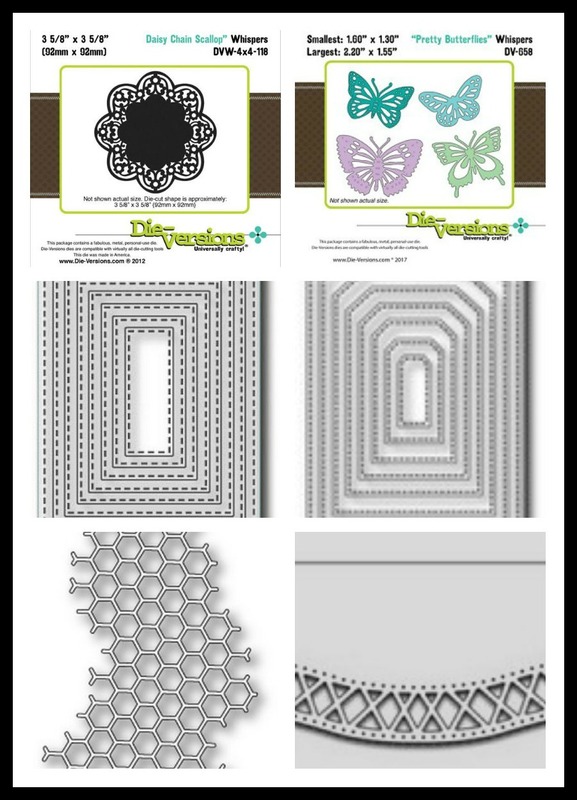 The pattern paper for the base layer is from Fancy Pants Designs. 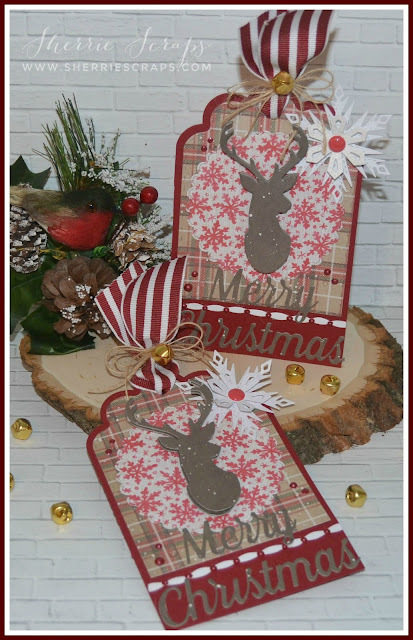 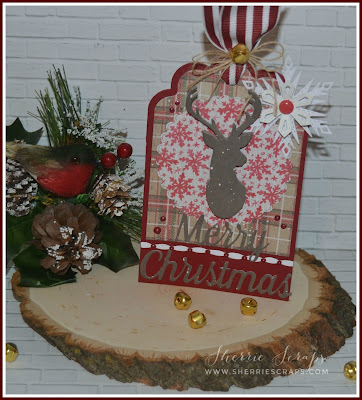 I then used the Memory Box Forest Tree Frame Die and layered that onto the base layer. 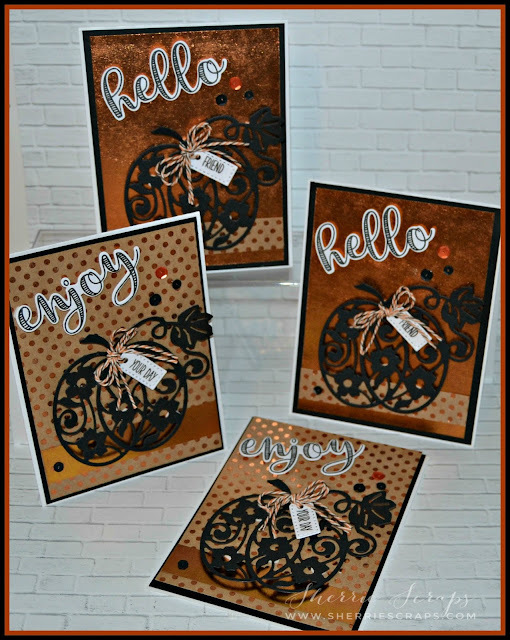 The hills are Taylored Expressions Rolling Hills Die. 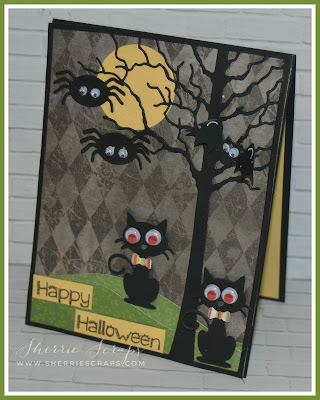 The moon is a Spellbinders Classic Circles Die. 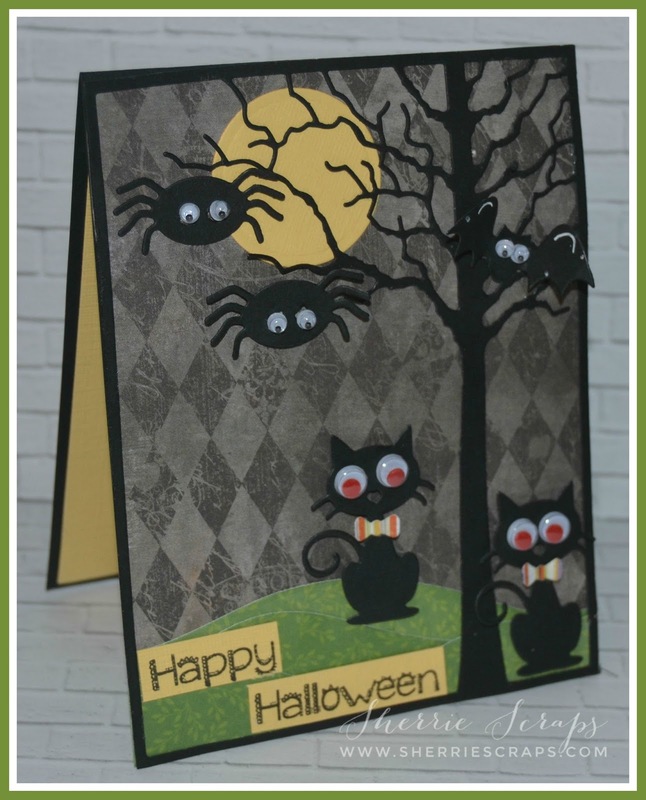 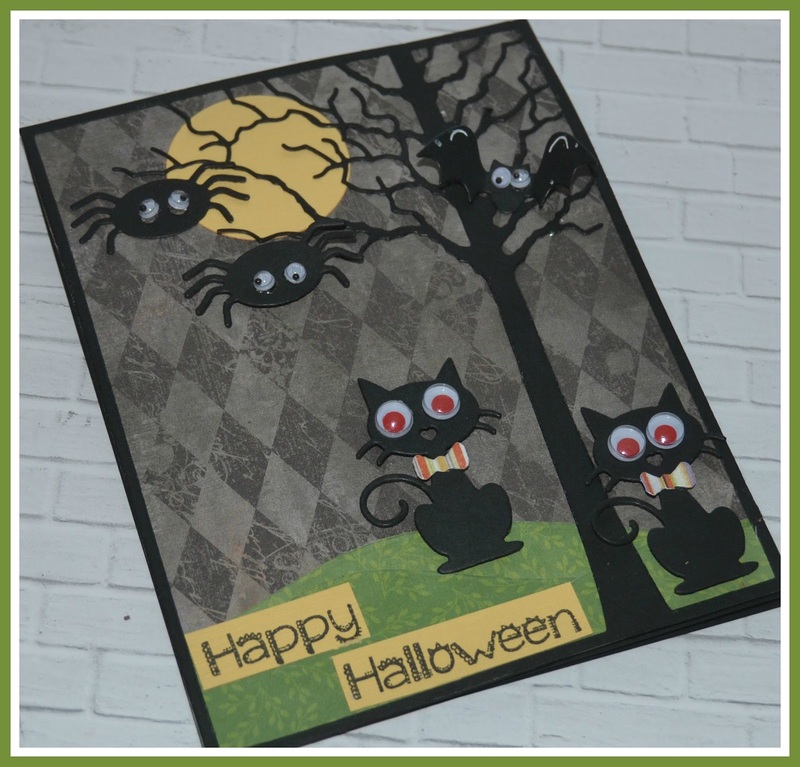 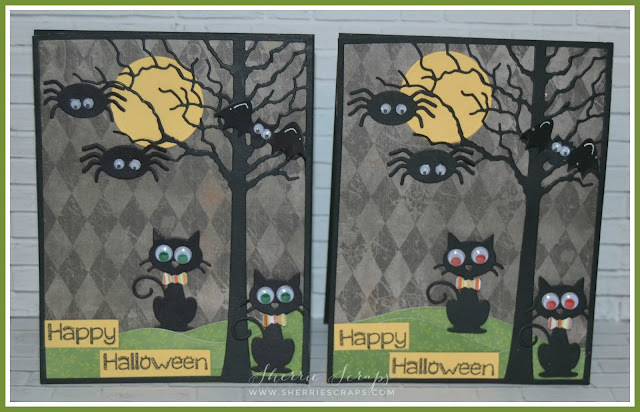 The cute little spider, bat, cats and bow are Frantic Stampers Cute Halloween Icon Dies set. I added little google eyes from my stash~eek, lol! 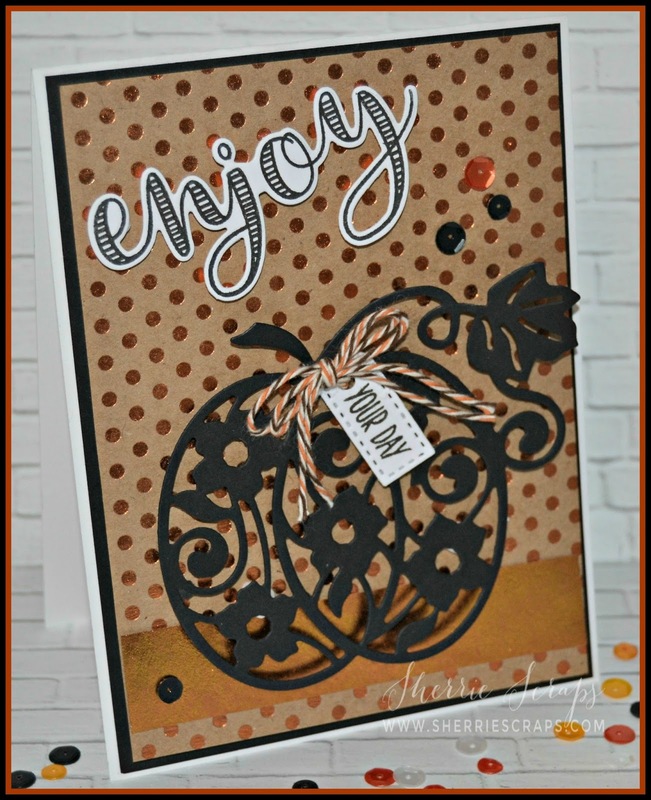 The Happy Halloween is and stamped with Jaded Blossoms Halloween Treats 2 stamp set.